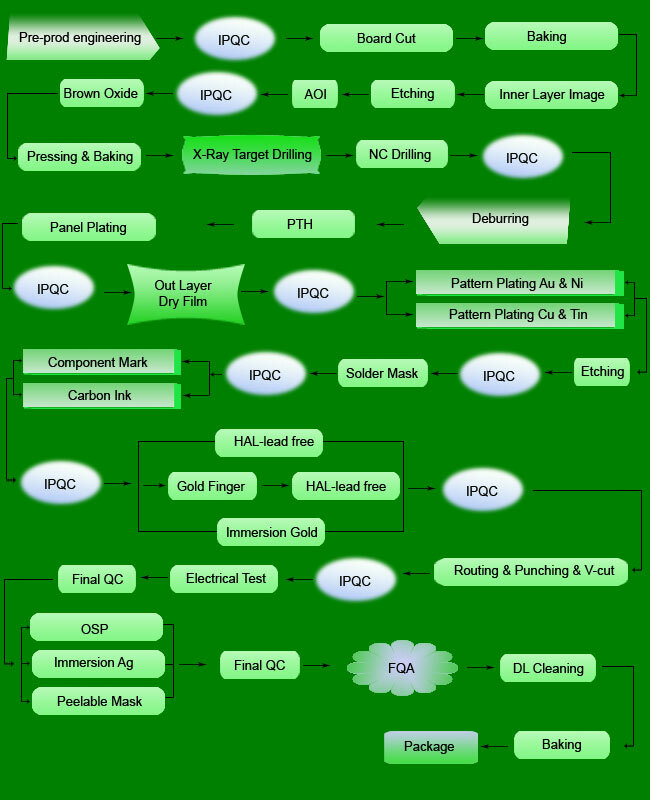 The engineering process in manufacturing and treating material for PCBs is the primary factor determining the quality of final printed circuit boards. 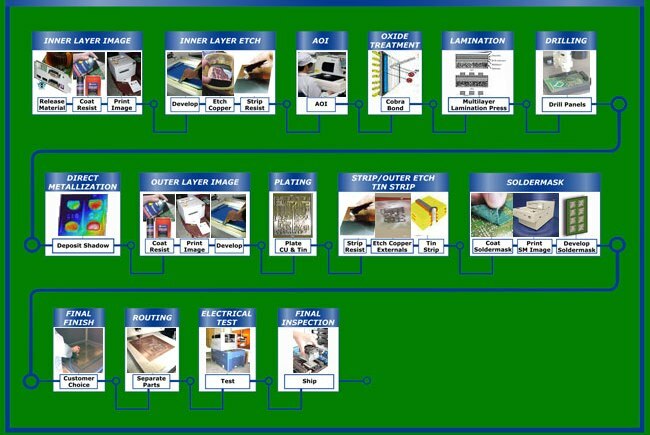 Standard Printed Circuit provides the best available engineering processes in each of our production plants. 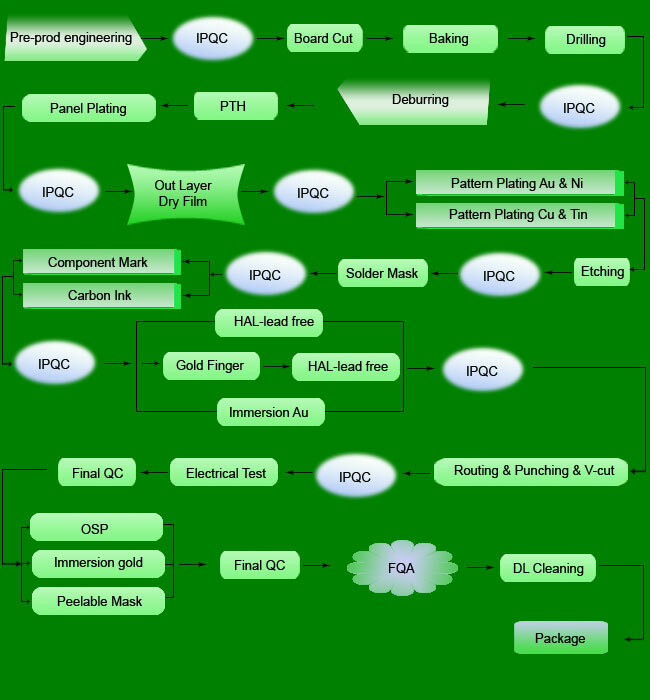 Each engineer we employ is an expert and an innovator in the field of printed circuit board production. Each worker on our lines is carefully trained in precision management of the machines and materials he or she works with. 1. IPC Standard Inspection and test criteria will be based upon IPC-A-600 and IPC-6012, Class 2 unless otherwise specified on customer drawings or specifications. 3. Laminate Single side boards: FR-1, FR-2 or FR-4 glass epoxy laminate per IPC-41011 with a minimum Tg 110 C. Starting clad copper weight to be 1 oz./ft2 minimum. Double sided plated-through boards: King Baord, FR-4 glass epoxy laminate per IPC-4101 with a minimum Tg of 130 C. Starting clad copper weight to be 0.5 oz./ft2 minimum. 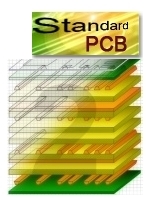 Multilayer boards: King Board, FR-4 copper-clad glass-epoxy (tine core) and laminateand material (prepreg) per IPC-4101with a minimum Tg of 135 C Starting clad copper weight to be 1 oz./ft2 minimum on all internal layers and 0.5 oz./ft2 minimum on external layers. 4. Copper Plating Holes with copper pads on both sides are to be copper plated through. Copper plating thickness will be in accorde with IPC-6012, Class 2 (0.0008" avg. minimum thickness). When copper pads on artwork are smaller or the same size as the corresponding finished holes, SCT will regard the hole as not requiring plating. 5. HASL Copper features exposed by solder mask, except nickel / gold plated edge contacts, will be coated by Hot Air Solder Leveling (HASL). SCT monitors the HASL processes to ensure that boards meet the solderability requirements of IPC6012 class 2. 7. Holes Dimensional Finished plated through hole size tolerances will be in accordance with IPC-D-300, Class 2: Finished holes up to 0.032" ... 0.003" Finished holes from 0.033" to 0.063" ... 0.004" Finished holes from 0.064" and larger ... 0.006"